Last week’s bracket? Pure trash. Elon, a seed? That evaporated once Delaware upset them 28-16. Eastern Washington, king of the Big Sky? Weber State says “not so fast,” delivering a humbling 14-6 win over the Eagles. Wofford, top dogs in the SoCon? The Furman Paladins had something to say about that, knocking the Terriers off the top spot with a 34-14 defeat. All the upsets and all the craziness made my bracket last week birdcage-lining material. This week I’ll do my best to have my projected bracket not be birdcage lining. Big Sky: All Eastern Washington had to do to knock Weber State out of the title discussion and keep on a clear path to the title was to win this Saturday, but they didn’t. The Wildcats’ win opens up the path for 3-0 UC Davis to win the Big Sky. Suddenly the Aggies, with a favorable schedule, are the team with a clear path. Big South: Kennesaw State, who have a bye week this week, have two very interesting games left. One is vs. 5-1 Campbell on 11/3, which will likely determine the Big South autobid. The other is vs. Jacksonville State on 11/17, which could be both the start of a most excellent Rivalry and could help determine one or more of the seeds. Colonial Athletic Association: There are seven teams in the CAA with zero or one conference losses. Two teams, Towson and Maine, are 3-0 and have some winnable games on their schedule, but it’s Maine who avoids a brutal matchup with James Madison on their schedule. If Maine can’t take care of business, Towson, James Madison, Delaware, Stony Brook, Delaware, or Elon could be involved in a massive tie for the league title, with the autobid determined by tiebreakers. Nobody wants that. Missouri Valley: North Dakota State. Off a bye week, this week they face one of the few teams that could knock them off the path for the Missouri Valley title – Illinois State. If they beat the Redbirds their path to the title will almost be completely clear, as they’ve beated South Dakota State head-to-head and the rest of the conference would have two losses already. Northeast: My current pick for the NEC title, Sacred Heart, has a big game this weekend versus one of the title contenders this weekend, Central Connecticut State. The winner of this contest will have the upper hand, though Bryant and Duquesne still loom in the background. Ohio Valley: Jacksonville State is still written in Sharpie. 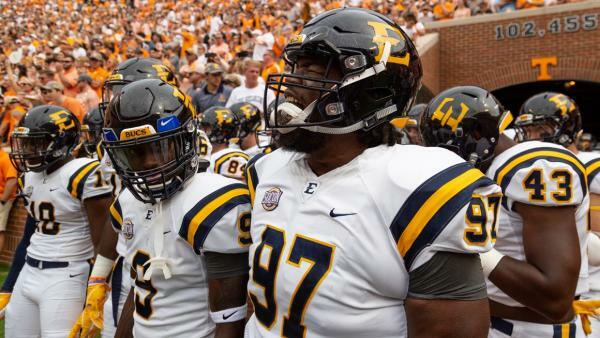 If they can beat Southeast Missouri State and Murray State in consecutive weeks, even an act from a higher power won’t be able to dislodge them from the OVC title. Patriot League: Speaking of teams written in sharpie, Colgate is pretty much there with a 3-0 record in conference. They have a bye this week after shutting out regional rival Cornell last week 31-0. Pioneer: Dayton gave San Diego a scare last week, but the Toreros won 36-34 to remain the favorite in the Pioneer Football League race. Southern: Is that... East Tennessee State alone on top of the SoCon? Yes – for the first time since 1996, the Bucs are in sole possession of first place thanks to their 26-23 win over The Citadel and Wofford’s upset loss to Furman last weekend 34-14. A huge road game against the Terriers looms this week. Southland: McNeese State sat on their bye week and just saw the planets align even more in their favor in the SoCon race with Lamar’s upset over Incarnate Word (27-21) and Abilene Christian’s upset over Nicholls (28-12). The Cowboys can now likely knock Incarnate Word out of the title conversation if they beat them at home this weekend. Falling out of the seeding conversation is – three different teams!. Elon, Eastern Washington and Wofford fell out, and the teams taking their place are… UC Davis, East Tennessee State and Maine. You might think picking those three seeds are a bit nuts, but take a peek at their schedules. I think they all have favorable schedules and if they can manage one big win (for example, ETSU beating Wofford this week), I think it won’t be a question that, say, a 9-2 or a 10-1 ETSU gets a seed.